Percussion: Vibraphone, 2 bongos, 2 congas, small drum, claves, temple-block, wood-block drum, tam-tam, gong, 4 cymbals, sizzle cymbal. Op.74 was written in 1980 and is dedicated to the memory of my friend Dietrich von Bausznern, who died in January of the same year as the result of a vicious illness. In the short movements, Invocation - Toccata - Requiem, the letters corresponding to note-names in the name Dietrich von Bausznern, D - E - C - H (English B) - B (English B-flat)- A- Es (English E-flat) - E, are treated in a variety of ways. The Invocation with its urgent gestures contrasts with the Toccata's flowing regularity, which gives the metal and membrane instruments an opportunity for virtuosity. At the centre of the concluding Requiem, all the motif material of the work is brought together in an arioso manner. Following an acoustic climax, a reprise leads into a quotation of the chorale melody "Wenn wir in höchsten Nöten sein" ("When we are in deepest need"). In extreme pp, the work dies away. ... a deeply impressive composition combining on equal terms a large selection of percussion instruments with the organ. Musical effects of startling intensity created a canvas of deep sadness and mental despair. Hummel succeeded in this work with the movements Invocation, Toccata and Requiem in conjuring up a profusion of magically fascinating musical visions. The chorale "Wenn wir in höchsten Nöten sein" is heard at the end alone as a cantus firmus, accompanied "forsakenly" by an unsettlingly pale bass. Daubs of vibraphone colour brought light. Claus Hecker on the organ and Axel Fries on percussion offered a successful interpretation, touching and disturbing. The unreal hovering of seventh and tritone sounds on the vibraphone, the long trills and whirring runs on the organ, everything is in choice, meditative colours. This takes on dynamic life and almost explodes in the driving regularity of the Toccata with pulsating rhythms on cymbals, wood-blocks and tom-toms, finally finding rest in a Chorale, slipping quietly into vagueness and openness. 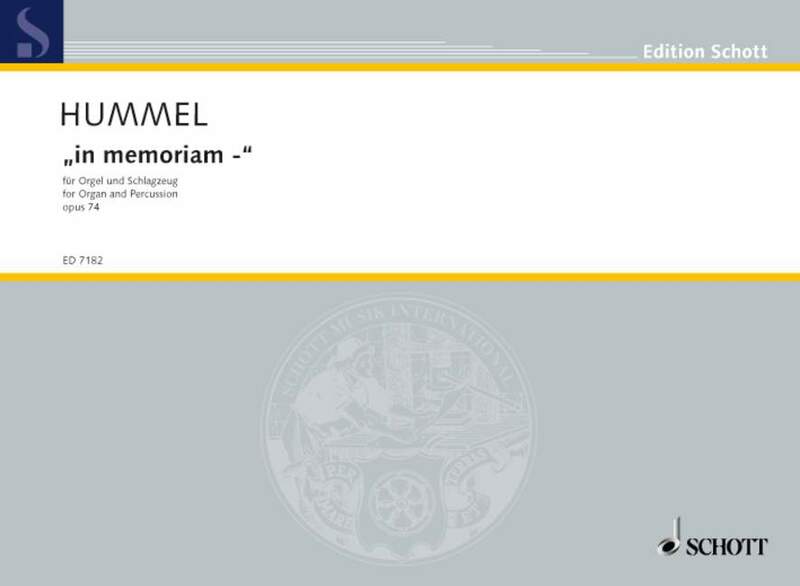 ... a work that stirs up feelings, even if - or precisely when - one does not know that Hummel took the musical material from the musically usable letters of the name von Bausznern and in the third movement - Requiem - quotes a chorale. In an "Invocation" of mounting tension, a superb "Toccata" (it was almost incredible that one percussionist alone could produce this rapid changing of the most varied tone colours) and a meditative "Requiem", both performers demonstrated the highest levels of musical partnership. Bertold Hummel's op. 74, "in memoriam", whose four sections on organ and marimbaphone revealed a multiplicity of highly sensitive musical thoughts, left a no less deep impression. Passages of pure mystical immersion provided intense contrast to the waves of emotion. Three economic movements without padding - the sometimes highly dramatic developments animated the soloists to gripping releases of energy. In the unfolding of copious musical gestures as also in the filigree details, organ and percussion parts are closely intermeshed.